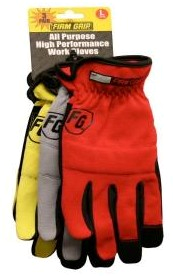 Are you looking for comfort but without the high price of a mechanics glove? You have found the glove that fits both. These gloves are constructed out of synthetic leather & spandex. These gloves have an elastic wrist for a comfortable fit. These gloves are machine washable. The gloves have spandex between the fingers to give a good fit. These gloves have a padded knuckle and palm to protect your hands.